"Love this and powdered peanut butter has fewer calories than regular peanut butter!" 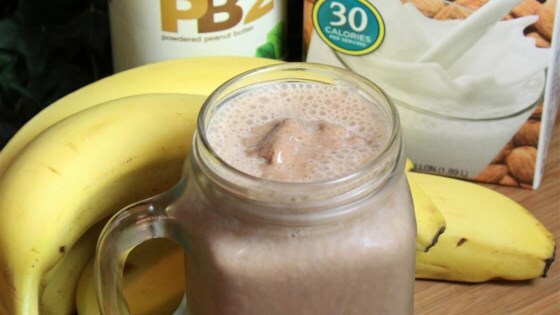 Blend almond milk, banana, ice, peanut butter, cocoa powder, and cinnamon together in a blender until smooth. I enjoyed this smoothie, it was my first time using peanut butter powder. I used about 1-1/2 frozen bananas. And the cinnamon taste didn’t bother me! I really liked it. I didn't add any cinnamon or cocoa powder since I used peanut butter powder with hazelnut which is pretty sweet for me. And I also used almond milk instead. I tried it without the ice first and the frozen banana made it thick enough for me. I also added about a cup of kale and really liked it! Very good, healthy recipe. It was a little thin so I added one scoop of chocolate protein powder. Will definitely make it again. Made it exactly as listed except only had 1/4 cup of almond milk so I added 1/4 of whole milk. I also used a frozen banana. Refreshing and delicious.